I definitely think cooking is an art. But if I was viewing the food as art itself, and I mean the visual aspect and not the flavour, I’d say sushi chefs have really got it down. I know sushi rolls are simply a convenient form for a snack, but with the colours and presentation of some of the platters I’ve seen, it’s almost like paint on a canvas. The vivd colours of the fish and vegetables and other ingredients set off against the white rice and dark green nori (seaweed) is a sight to behold. My favourite roll is a unique one call the Jade Green roll at a local Japanese restaurant called Koganei. 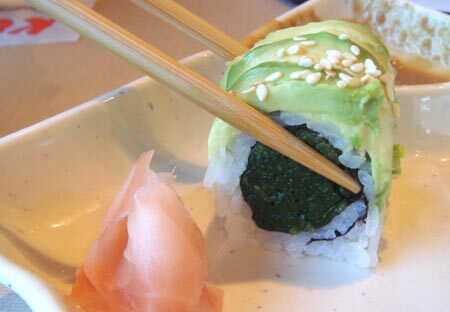 Filled with spinach, then wrapped in nori and rice and coated with avocado and sesame seeds, it is served with a mouth-watering peanut sauce. I’ve never found anything similar anywhere else, and it is one of the many things that takes me back to the same restaurant time and again. You know me. I like the peanut sauce better than the Jade Green roll. Why don’t all rolls come with peanut sauce?